How does home care differ from home health care? A: By definition, home care is any form of care provided to a client within their home. The term in-home care is typically used to describe services of a non-medical nature such as what Crown Cypress At Home provides. These services include companionship, light housekeeping, meal preparation, laundry, errands, and medication reminders. In contrast, home health care provides services that may require medical supervision, such as occupational therapy, speech therapy and physical therapy. Frequently, home care and home health care are delivered simultaneously to provide all facets of support in the home. How much does in-home care cost, and how do I pay for it? A: Cost of in-home care is based on the results of a personal care assessment that determines the amount of time needed to provide appropriate support in the home setting. Whether you require a minimal amount of time each week or 24/7 support, Crown Cypress At Home will provide solutions to meet your personal and budgetary requirements. Long-term-care insurance may cover the expense of your in-home care. Often, though, the client and/or family member is responsible for the cost. Crown Cypress At Home is a Choices provider, which may be an option your case worker offers. Will I have the same caregiver every time? What if my caregiver is sick or goes on vacation? A: Crown Cypress At Home realizes the importance of consistency of care. There may, however, be occasions when your regular caregiver is unable to serve due to illness or scheduled time off. Except for those infrequent occurrences, we make every effort to maintain consistent relationship-based care. If your caregiver is sick or goes on vacation, our Client Care Coordinator will arrange for another caregiver to help you and will contact you in advance of the change. Our coordinator will review your personal care plan with the interim caregiver to make certain your needs are met. What is a Care Plan and how often is it changed? A: Our experienced staff develops an individualized and confidential plan of care for each client. The purpose of the plan is to document your specific in-home needs and confirm our plan of action to meet your requirements. Once a client, their family members and our Client Care Coordinator agree on the Plan of Care, the office staff will pair you with appropriate caregivers and develop an in-home care schedule. Care plans are reviewed with the client and family at least every six months but may be reassessed more frequently to ensure that the client is receiving the appropriate care services and is pleased with caregivers. Changes in a care plan will always be addressed with the client and a designated family member. Do you provide services only in the home? A: Crown Cypress At Home also provides companionship or personal services to clients in assisted living or nursing homes — anywhere additional attention and care is needed. Visit Crown Cypress Assisted Living. Why should I hire a caregiver through your company instead of using a friend? A: Crown Cypress At Home caregivers go through rigorous screening processes, including local and national background checks as well as personal and professional reference checks. Each individual is carefully trained by our experienced professionals before providing client care. They are also consistently monitored as they perform their duties. We strive to hire only the highest quality care providers — only those we would want to care for our own family members. What is a typical amount of time spent weekly in a client’s home, and what are the most commonly requested services? A: Times vary greatly, based on individual needs. Over 50% of Crown Cypress At Home’s current customers require between 5-11 hours of assistance on a weekly basis. Some need much less while others require much more. Housekeeping, laundry, meal preparation, errands, companionship and personal grooming are the most typically requested services in individual care plans. However, each client is periodically assessed on an individual basis to ensure the time and services they are receiving are those that best meet their needs. We’ll be there for the hours you want and need us to be there. 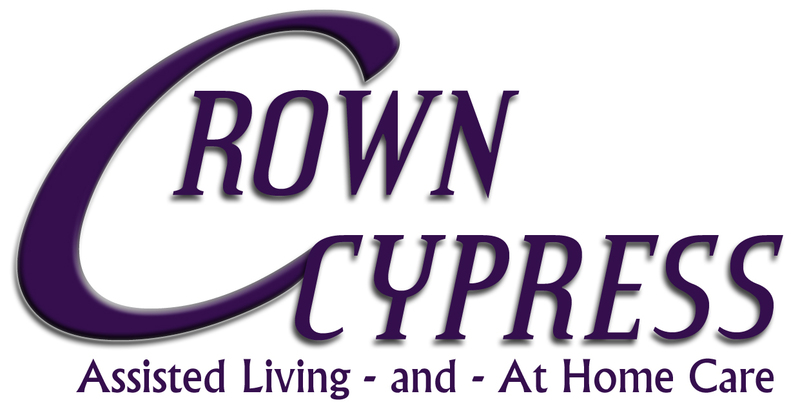 What services does Crown Cypress At Home offer? Is it better financially to stay at home and take care of a loved one or is it better to hire someone such as Crown Cypress At Home? A: On average, a person needing stay-at-home care will need this for five years. If you quit your job to take care of a loved one you will, on average, spend five years doing this. During that time, you will not be eligible for promotions, your work skills and qualifications may atrophy, and when you do attempt to return to work, you may find it hard to re-enter the workforce doing what you were doing, especially at the pay you were receiving. Alternatively, if you hire someone such as Crown Cypress At Home care services to help, then you stay in the workforce. You probably continue to gain work experience, promotions, pay raises and bonuses. If you make about $32,000 or more at your job, then it is probably to your financial advantage to continue to work and then hire help at home. Not only is this to your financial advantage, but it also is much less stressful for you. Even if you earn less, you may find it wise to hire us part-time to give you time to take that family vacation or work related trip. Should I hire a live-in nurse? A: It costs much less to hire Crown Cypress At Home who provides a team of people to help. We also provide a variety of services including cleaning, meal preparation, and many other things that a typical nurse does not. Caring for someone around the clock can degrade your own mental and physical condition. Everyone needs a break, even the professionals. While we usually keep the same person with your loved one every day, we have a team that can fill in when someone is ill or needs a vacation. Do you help with more than the physical needs? A: Not only will you live longer but you will also be healthier and enjoy life more if you eat regularly, take your meds when you are supposed to, and interact with others. Getting out of the house may not always be possible; but a trip to church, a concert, or a dinner out can make a huge difference in one’s life. Not only does it build anticipation but it also creates an incentive to be presentable and take pride in oneself. And the memories after the event can help keep the spirit up. Our At Home team works to not only take care of the physical needs but also the needs of the spirit!